Yellowfin Ventresca Tinned Tuna for sale. Buy online at Zingerman's Mail Order. Gourmet Gifts. Food Gifts. Top of the tuna intensity scale. The most intense tuna we offer. Yellowfin tuna fish have flesh that’s oilier and richer than bonito (albacore). The toro belly cut—ventresca—is correspondingly richer than that from bonito ventresca, which is already quite a silky and intense bit of fish. This is a special occasion fish—use it where the texture and taste can show off. Rest some on a bed of greens, simply dressed with oil and lemon or on some crostini with a bit of oil and maybe a piquillo pepper. 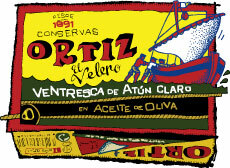 From the venerable Spanish firm, Ortiz, who catches all their tuna by line, not net.